The forecast was predicting a showery day with blustery southerly winds, but when we met by the A837 just west of Oykel Bridge, it was clear and dry, the sun was breaking through and there was only just enough of a breeze to keep the midgies at bay. We headed away from the road, over the undulating track leading to Loch Ailsh and Benmore Lodge. It wasn’t long before we were walking along the side of the loch, enjoying the views ahead to the Munro summits of Ben More Assynt and Conival. Passing by the lodge, a good track leads up by the River Oykel. This is a section of the route shared with the Cape Wrath Trail (CWT) but despite the increased popularity of that trail, we had the area to ourselves on this particular morning. The river was very low after the recent dry spell and there were lots of scenic rocky falls. Passing through a gate, we reached the confluence between the River Oykel and Allt Sail an Ruathair. Our route followed the latter and we branched away from the main CWT, heading north. Another good path leads up by the Allt Sail an Ruathair towards the end of Ben More Assynt’s southeast ridge and we followed this, making easy work of the few river crossings along the way. The path here climbs up and over the shoulder of the ridge, reaching a high point of 430m, before descending towards the upper reaches of Glen Cassley. This is one of the highest points of the whole crater route and, as such, it is a great vantage point to look over the site of the impact (check out the view here!). Despite 1.2 billion years of geological activity since the event, you can still sense something of the crater in the landscape, with a large area of relatively low lying hills and glens, surrounded to the south, north and west by a ring of high hills. We headed to the path’s high point and then turned to the open hill, taking a line up the broad ridge of Meall an Aonaich – aka Eagle Rock. An easy angled ascent with some nice grassy lanes between quartzite boulder fields allowed for a steady ascent. As we climbed the strength of the wind really picked up, blasting across the ridge and, in the distance, showers could be seen developing over the Beinn Dearg group near Ullapool and closer to hand over the slopes of the neighbouring Corbett, Breabag. It wasn’t long before the showers reached us too and we stopped to pull on waterproofs, but by the time we reached the well-built trig point marking the top of Eagle Rock, the winds had blasted the rain away and we were back to blue skies and sunshine. Descending a very short distance off the northern side of the ridge was all it took to get out of the wind and we had a perfect sheltered lunch spot with views out over the area of the crater and to the hills of the far north, including Foinaven, Ben Hope, and Ben Loyal. It was nice to look down the length of Glen Cassley, stretching away eastwards, and, in the distance, you could pick out the small white speck of the Crask Inn below the imposing slopes of Ben Klibreck. Our descent took us northwest to the bealach below Carn nan Conbhairean, then we headed off the ridge, down steep grassy slopes to the secluded Dubh Loch Beag. This is a lovely hidden lochan, tucked away from in a small hanging coire. I was surprised to put my hands in the water of the loch and find that it was actually warm! Some careful route-finding is required walking around the loch to avoid the peat hags before a more gentle descent led down to gain the path (and the CWT) in Glen Oykel. It was a lovely time of year to be walking here with the heather in full bloom and lots of Devil’s-bit Scabious flowering across the hillside. By this time, the sun was fully out and it was time to get rid of spare layers and get the sunglasses out. The upper reaches of Glen Oykel form a stunning glacial valley and it has a very remote feel to it. 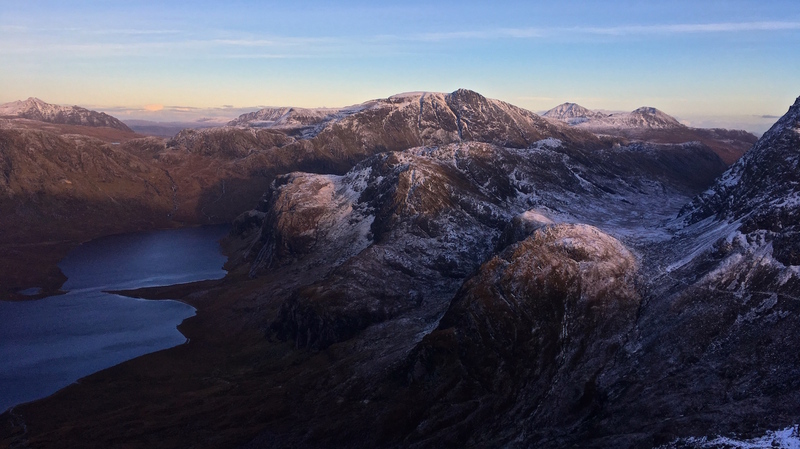 There are great views up to Conival and the crags of Breabag. All that remained for us was a pleasant walk in the sunshine back to Benmore Lodge, with another easy ford of the Allt Sail an Ruathair, and then on back to the road. As we walked by Loch Ailsh once more we were constantly accompanied by Scotch Argus butterflies fluttering about and we made a few stops to admire the views back to where we had been. Out by the road, the views west to Suilven and Cul Mor were spectacular in some nice early evening light. It was a fine ending to another fine day on the crater route!